Flea markets seem to be everywhere, especially in the summertime. But do the vendors actually make any money, or is it just a fun weekend hobby? A few years ago, my wife and I put the idea to the test and spent a summer as flea market vendors, selling everything from crafts to recycled Barbie dolls. We traveled to various markets in Michigan and often slept in our van to be ready to set up first thing in the morning. While our best days only earned us $200, we never lost money and we had a great time. In the process, we discovered some people do make a decent living as flea market vendors, while for others it’s just a fun way to make a little extra cash. Want to try it for yourself? Here’s what you need to know. What Do You Need to Start Selling at Flea Markets? Launching this weekend business won’t cost you much money. Aside from products, you’ll need at least one folding table (about $40), which you might already have. A few plastic storage tubs (about $8 each) will work for carrying your products and as extra display tables. Any vehicle will get you to and from the markets, although having a small car will limit your product options. What Can You Sell at a Flea Market? Just about anything goes at most flea markets. Starting simply, like we did, is a good way to test the waters before investing more in this business. We went to thrift stores, rummage sales and garage sales to find products to sell. We bought thrift store stuffed animals for $1 and sold them for $3 to $5. I also put a few little 25-cent toys into Mason jars to create something I called “canned critters” and sold for $2. We bought foreign coins at a coin shop for 10 cents each, drilled a hole in each coin’s center, and added a string to make necklaces that kids bought for a dollar or two. At venues that leaned more toward the “craft show” end of the flea market spectrum, we sold even more handmade items. My wife offered handmade jewelry, pewter figurines glued to colorful rocks and sea shells, and fish scale earrings we had bought by the dozens in Ecuador. My walking sticks, which cost less than 50 cents to make, sold for $6 to $24. I cut the wood myself and added extras like leather handgrips made of strips cut from thrift store jackets. Consider whether you plan to specialize or sell a variety of things. Vendors can make good arguments for both strategies, but we were experimenting and didn’t want to invest much in this business, so selling lots of different items made more sense for us. 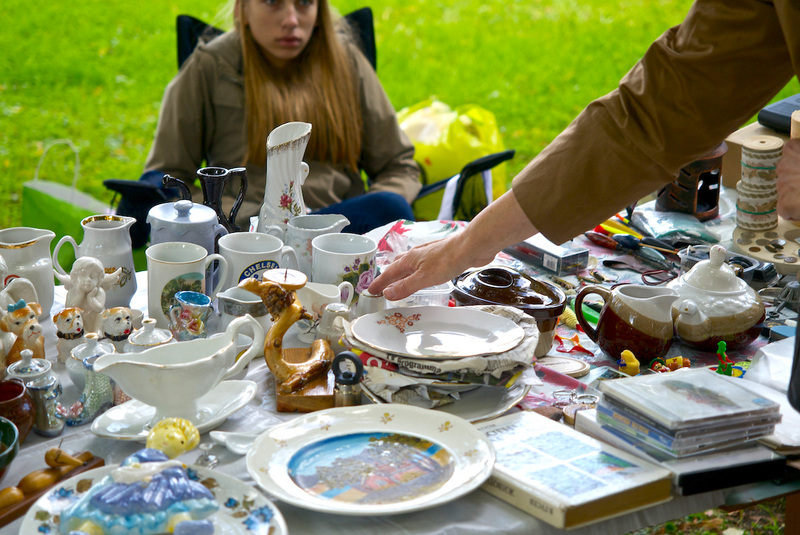 In fact, a good way to start really cheap is to have your next rummage or garage sale at a flea market. For less than the cost of an ad in the newspaper, you’ll have access to hundreds of customers, and you won’t have to spend a thing for inventory — just clean out your house. Serious sellers may want to check a wholesale goods directory to help them decide what to sell and where to find inventory. Google the supplier names plus “review” to see what others have said about the companies — not all of them are easy to work with. For low-priced items, look for a company that supplies dollar stores. Which Type of Flea Market is Best for Your Business? Flea markets come in many varieties. Some double as farmer’s markets, others specialize in antiques; some are seasonal, others year-round; some are inside, others outside; and so on in different combinations. But in terms of doing business, consider the two basic types: long-term and classic. One type is best for implementing a solid business plan and the other works best if you want to experiment cheaply or travel from venue to venue. Long-term markets are usually indoors or in permanent structures, rent spaces for longer periods of time (usually more than a month) and require leases and other paperwork. One long-term market is the Flamingo Island Flea Market in Bonita Springs, Florida, which charges $289 per month for a 10-by-10-foot space in its slower section. You’ll pay 6% sales tax on that rent as well as a one-time deposit of 50% of your rent and a $10 monthly utility fee — plus you have to buy a county occupational license for $55 per year. Even starting off with the cheapest spaces, which measure two feet by five feet and hold one small table, will cost you more than $300. With a good business plan this type of market can be great. They’re usually well-established, you’ll pay a lot less than you would for a storefront in a strip mall, and you’ll only have to work three days per week at most of them. Talk to the vendors at this kind of flea market and you’ll find that some of them have been there for many years. Many don’t have jobs or retirement income — they’re making a living from this weekend business. Others, of course, just like having some extra cash. In contrast, the second type is the classic flea market where you just pull up in the morning and pay cash for your market spot. At the always-busy Tanque Verde Swap Meet in Tucson, Arizona, you simply arrive on a Saturday morning with your car loaded with goods and pay just $15 for eight hours in a 11-by-26-foot space. To make it even cheaper, choose the 3 p.m. to 11 p.m. Sunday market, where you’ll pay just $8. Markets like Tanque Verde allow low-risk experiments to see what sells and how much you might be able to make. If you find a winner, consider taking your products to a longer-term market where you can guarantee a regular spot. Or try other nearby classic flea markets where you pay by the day — you might find that you do best when you move every week. Try using an online flea market directory to find venues near you. Many markets don’t have websites, so you may have to call to see how they operate. Don’t automatically rule out the small ones. A Sunday-only market in northern Michigan, so tiny it didn’t even charge vendors a fee, helped us make the most sales of our summer! Other vendors love to talk when business is slow. Through many conversations, we discovered that many people made much more money a generation ago. Flea markets are apparently not like they used to be! But we noticed one type of business that does very well now: the flea market dollar store. The basic setup is simple. Lay out at least 100 plastic tubs full of products on the grass in several rows, each with items for $1, $2 or $3. At the end of the day, just put the tops back on the tubs and load up the truck. These businesses are often too busy to be run by just two people, and they require an investment of $10,000 or more, not counting the panel truck you’ll need to carry your inventory. But they’re worth considering if you want to make some serious profits. Some markets hold auctions, which might be a good option for specific high-value items — or to help you get rid of inventory that doesn’t sell. When we went to the Copemish Flea Market in Michigan, the Sunday auction was the biggest draw. For a small fee, the market would auction anything you wanted to dump. Watch out for related opportunities to earn money at flea markets. Food vendors might be the most profitable businesses at many markets. The owners of the market almost always limit how many they allow, so you might have to wait for an opening — or buy one from a current vendor. Finally, if you’re more of a manager than an entrepreneur, you might consider buying out a vendor. Recently, my wife and I looked into several flea market businesses that were selling for $10,000 to $15,000 — essentially the cost of their inventories. One was doing $2,000 in sales each weekend. It wasn’t the right time to buy — here in Florida, market season is actually in the winter, with sales dropping by 80% each summer according to other vendors. But who knows? Maybe this fall we’ll get into the flea market business once again. Your Turn: Have you ever sold items at a flea market?